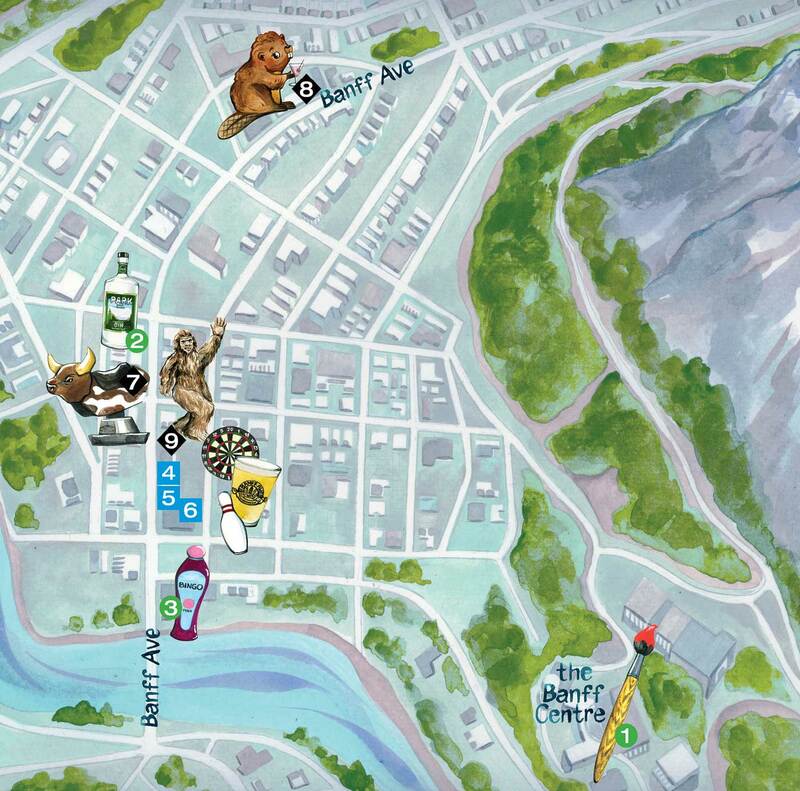 Where to go if you want a big night out in Calgary’s go-to mountain party town. We can say that we go to Banff to revel in the alpine grandeur, but let’s be real: sometimes we just go to Banff to party. With their mix of visitors and tourists ready to cut loose and hordes of young seasonal workers of the “live to ride” mindset, mountain towns are notorious for nightlife, and Banff is no exception. Once the ski hills close and the sun goes down, you can sip craft cocktails, down pints of locally brewed beers, sing karaoke and even dance with a sasquatch (really). While finding a place to party in Banff isn’t hard, what can be trickier is finding the right place for the kind of night out you want. As such, we’ve pinpointed some of our favourite spots, categorized with helpful ski-run markings of a green circle (pretty laidback), a blue square (you’re gonna feel something tomorrow) and a black diamond (threat level midnight), so you know what to expect. Photograph courtesy of Maclab Bistro. This low-key gem on the campus of the Banff Centre for Arts and Creativity has lounge seating and big windows that look out at the surrounding peaks. The view is spectacular at sunset, making it a perfect start to any night. Part-café-part-wine bar, you can fortify your carbohydrate reserves here with a flatbread pizza while indulging in a glass of prosecco (or two) before you head back into the town of Banff. a table, especially if you’re with a big group. Unpretentious fare like cheese puffs, wings and pints are on the menu at the Banff Legion, where the crowd is loyal and friendly and unapologetically old-school. Paint nights, Bingo Thursdays and Free Pool Fridays allow for interactive evenings, while the no-hats-no-swearing Legion rules ensure the night’s festivities remain green-coded from start to finish. Insider tip: a bingo blackout can win you up to $1,000, but it would be bad form not to buy a round if you do take the pot. This quintessential mountain-town pub has been in business for more than two decades and is beloved by locals for its cheap drinks and hole-in-the-wall feel. Here you can watch the game, play darts and earn the gratitude of your friends with a round of reasonably priced shots. Amiable owner Tommy Soukas can often be found slingin’ pints and framed photos of visiting celebrities underscore this pub’s universal appeal. Perched above the strip, the Banff Ave. Brewing Co. has a reputation for great views of the town, top-notch pub food and, of course, beer. Believe the hype: the Reverend Rundle Stout is creamy, smooth and approachable and the Banff Ave Blonde Ale cuts the richness of indulgent menu offerings like thick, buttery pretzels with beer-cheese fondue dip. The quality fare and fun atmosphere make this spot an après-ski essential. Photograph courtesy of High Rollers. Banff-goers of a certain age might remember this space as the notorious nightclub and bad-decision factory Silver City. 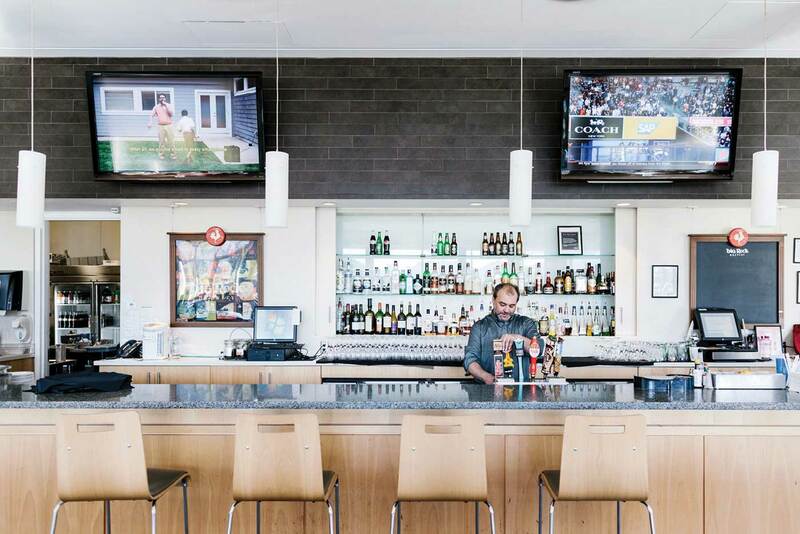 These days it’s home to High Rollers, a bowling alley-beer hall-pizza joint. 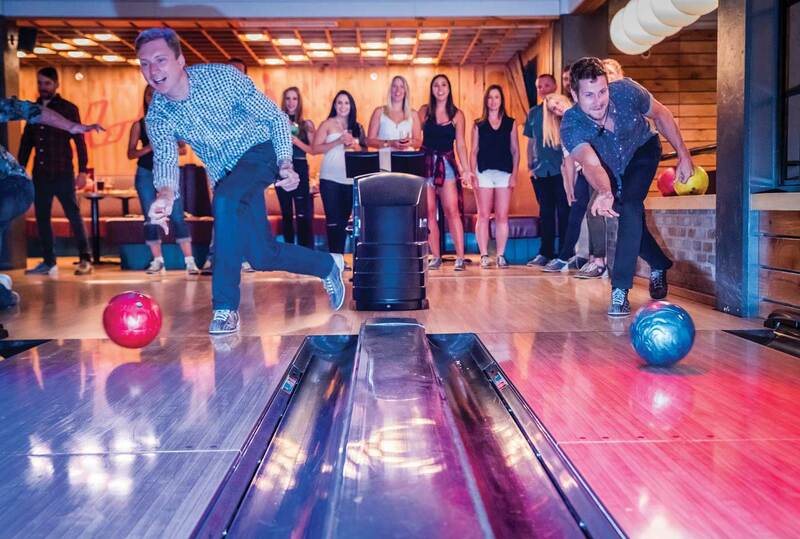 Lace up a pair of retro-styled kicks and hit the lanes, then move the party over to the neon-lit bar area where long wooden tables practically guarantee that you’ll end up making friends. You can expect the popular New York-style thin-crust pizzas you’ve ordered to disappear like the Millennium Falcon (so get a bunch) while you’re deciding which beer to order next from the 48 taps. Most nights, when you reach the top of the staircase leading up to Wild Bill’s, you’ll see live music being played and a rocking dance floor (last fall they had a Spice Girls cover band up there that completely dominated). 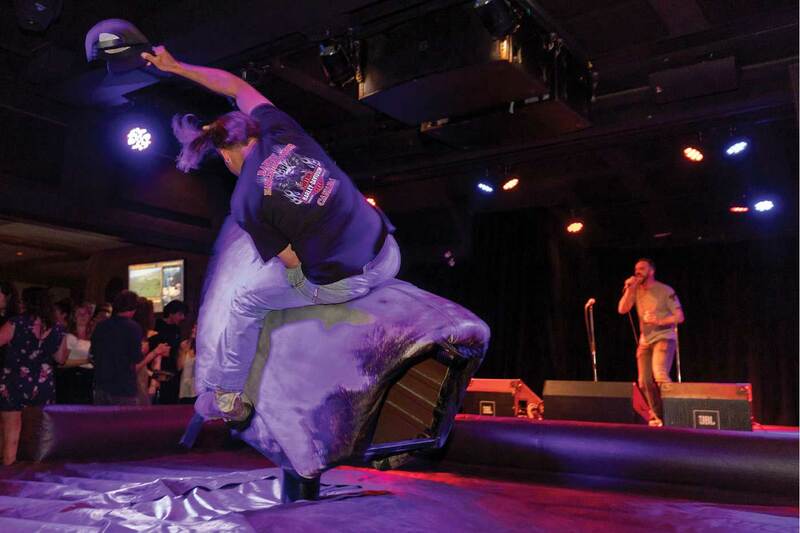 Oh, and there’s a mechanical bull as well, so if “danger” is your middle name you can clamber onto it and get tossed about madly as the crowd cheers before you’re launched into the air like an uncaged dove. In short, Wild Bill’s lives up to its name: it’s raucous, busy and a whole lotta fun. 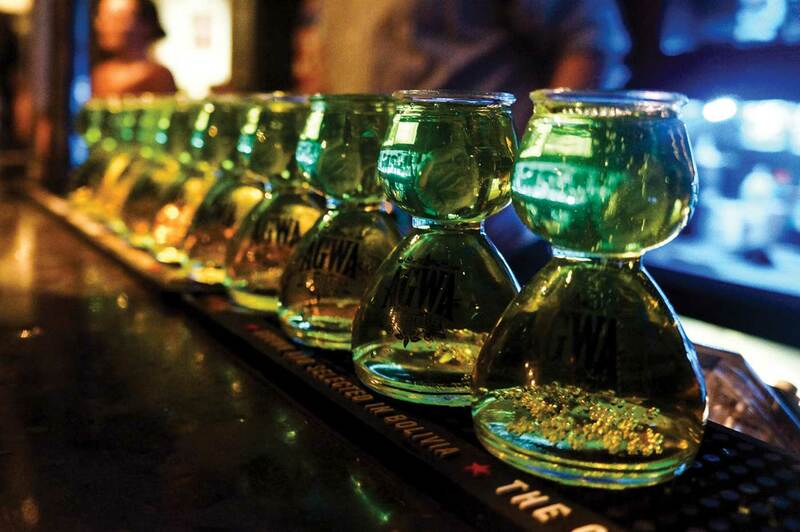 This rowdy watering hole at the Samesun hostel is notorious for something called the “Agwa Bomb” — part Bolivian liqueur and part Rockstar energy drink, this shot glitters like an emerald and overwhelms with its herbaceous unfamiliarity. Programming here runs the gamut from the popular taco specials, to bingo, trivia, open-mic nights and karaoke, so prepare to warble like a songbird should a microphone suddenly appear in your hand. Photograph courtesy of Dancing Sasquatch. The ultimate end-the-night spot in Banff dishes up bottle service, a raging dance floor and enough spilled liquor to glue your shoes to the ground. 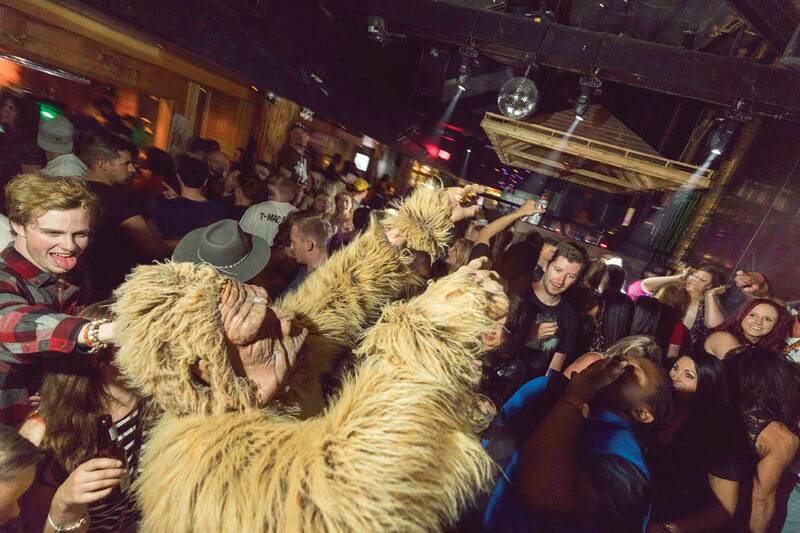 As you floss and fist-pump while dappled in the rainbow lights, you might catch sight of a tall, furry, lumbering sasquatch shaking it amongst the partiers. It’s no hallucination; the bar’s namesake mascot comes out at night to bring mountain folklore to life.